Strategize and plan ahead with the new hold-feature, exclusively on Gaminator! 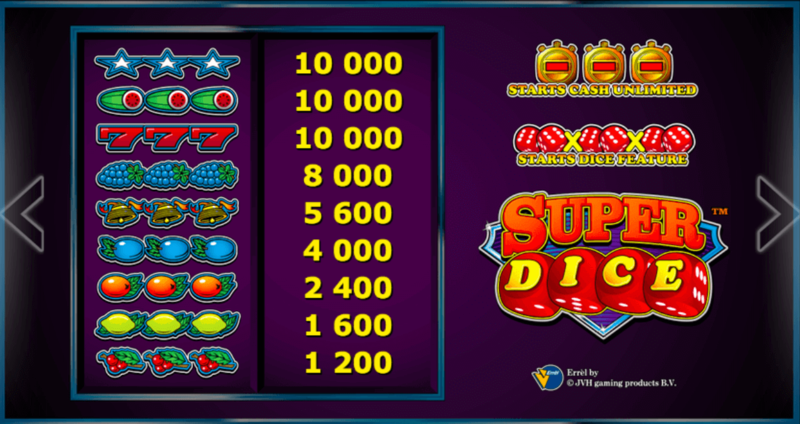 Super Dice™ is one of the latest additions to the diverse slot portfolio on Gaminator, and we are curious how you guys will like it! Play across three reels and using up to five win lines, and use our brand-new hold-feature, the bonus chance at extra credits with every spin and of course our renowned gamble feature for the perfect mix of high-risk high-reward slot fun! 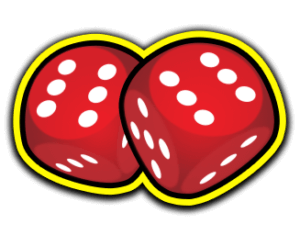 The red dice is a very special symbol of the Super Dice™ game. When three of them show up at the same time on any line, the dice will be triggered. Press the stop button to stop the dice. 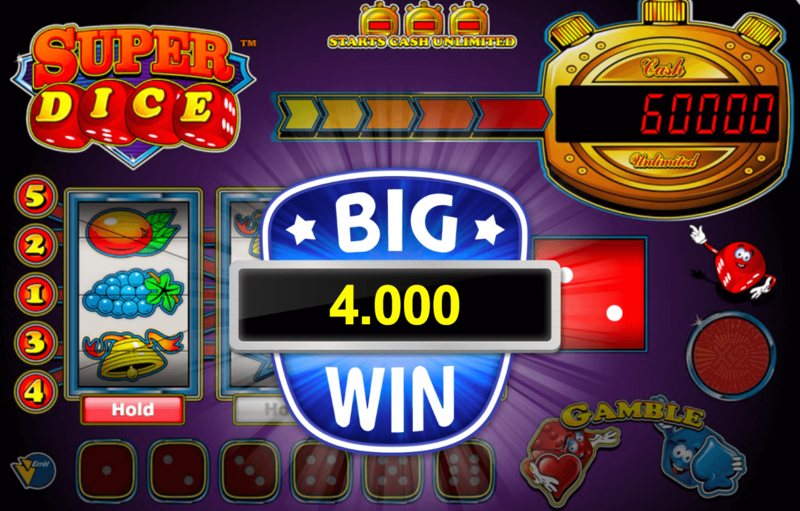 The sum of the points shown on the winning dice will be the sum of the free spins you’ll get. If the three golden stopwatches show up at the same time on any line, the credit bonus shown in the stopwatch in the upper right-hand corner will be paid out. Like this slot? Rate it! Reels, Dice and Credits galore! This slot machine will have you high on adrenaline for the entire duration of your gaming session. Just take the stopwatch at the top right corner of the screen for example. 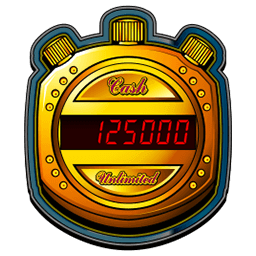 With every spin of the reels the number displayed will change, and with every single spin you have the chance of being awarded the displayed amount! No extra mini games you need to overcome, no additional hoops to jump through – once you manage to align three of the stopwatch symbols across all reels at the same time the prize is yours! Feeling like pushing your luck even further? Risk it all with our famous gamble feature. This way you get to double your winnings of the round – but only if you are lucky! Don’t worry too much, though, it’s a true 50/50 bet every time! Win combinations across all three reels are pretty standard. Bright red cherries, lemons, and juicy oranges are the lowest paying symbols, followed by ripe plums, lovely sounding bells, and fruity grapes. The top tier of winning symbols are red sevens, watermelons and brightly glowing blue stars, all of which net you a four-digit multiplier to your stakes! A click on the paytable button at the bottom edge of the screen will list all possible symbols, win combinations and win line arrangements for you. Which is especially useful in regards to another new feature in this exhilarating slot game; the hold-feature. You can freeze any reel at any time during regular play using the “Hold” button below the reel. This way you can increase your chances of getting a high paying combination, while only paying your regular stake for the increased win chance! 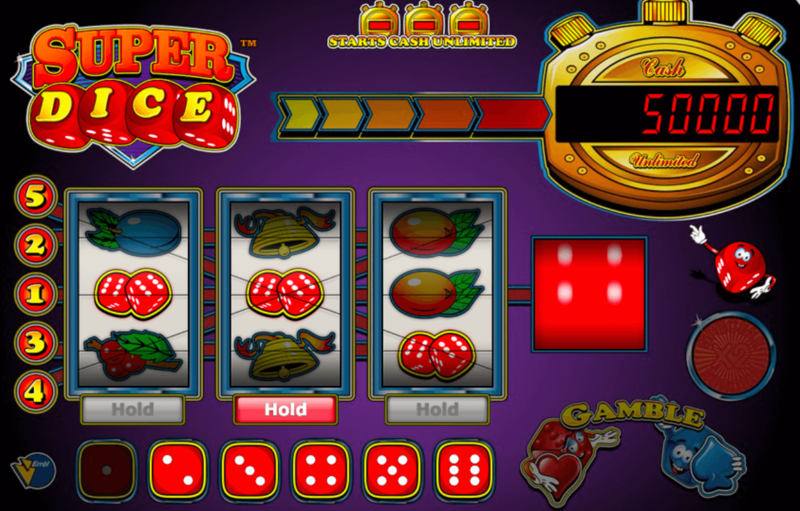 And to make things even easier for you, Super Dice™ will hold two reels for you automatically as soon as two symbols of a kind show up along any currently active win line. Winning has never been this easy! Super Dice™ is the perfect mix! With bonus credits available every round, free spins (no stake needed!) 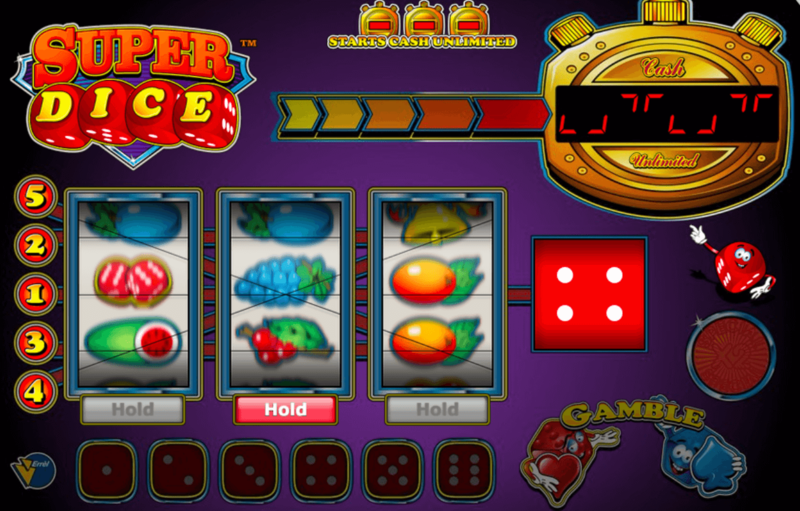 and the possibility of freezing reels during play, Super Dice™ is without a doubt one of the most feature-rich slot games of recent times. And to every new player not knowing what to expect we can only say this: Play a few rounds, see the dice feature in action, enjoy the free spins and crazy high jackpots, enjoy the thrill and the adrenaline and then simply decide if relaxed casino gaming is for you. Gaminator is the new social gaming community! Online casinos are a dime a dozen. But platforms where you can try out only the best slot machines and casino games, for free and directly in your browser? Where can you play them without the need for extra downloads or the hassle of logging in? You would have to look for a long while to find a site optimized for just such things, but luckily you already found the best social casino on the web – the Gaminator Online Casino! Gaminator mobile+ is a free online game for entertainment purposes only. You cannot win real money or real items/services by playing our free slot machines. The virtual currency used in this game can be purchased in the in-app Shop using real money. Gaminator credits cannot be exchanged for cash or be paid out in any form; they may only be used to play this game. All casino games in this app are intended for adult audiences only.